There’s only four games on the schedule for tonight in the NHL, but that doesn’t mean it won’t be without fireworks. The Toronto Maple Leafs and Buffalo Sabres renew their rivalry, while the Tampa Bay Lightning and Washington Capitals clash in a battle of Eastern Conference division leaders. As teams prepare, we’ll be here keeping track of all the minor moves. It wouldn’t be a weekday without a Justin Bailey transaction, as the Philadelphia Flyers forward has been sent back to the AHL once again. Bailey has been involved in eight transactions since the beginning of March, bouncing up and down as the team needs an extra body. The New Jersey Devils have sent Colton White and Nick Lappin back to the minor leagues as they finally start to get healthy. The Devils were without nearly half of their normal roster recently, but could get several players back in the next few days. The team will welcome in the Boston Bruins tomorrow night, at which point White and Lappin could be on their way back up if more insurance is needed. Defenseman Libor Sulak has been recalled under emergency conditions by the Detroit Red Wings, who may not have Trevor Daley back before the end of the season. Sulak is another one of the Red Wings’ young players to make his debut this season, and has played six NHL games. Cameron Gaunce is back up with the Lightning, now that Dan Girardi has been downgraded from day-to-day to out indefinitely. Gaunce will serve as the team’s seventh defenseman until Anton Stralman is ready to return. With Valtteri Filppula out for four weeks, the New York Islanders have recalled Tanner Fritz from the AHL. Fritz has played just four games with the Islanders this season, but offers an experienced professional to give the team some center depth while they deal with Filppula’s absence. The Pittsburgh Penguins have recalled Adam Johnson from the AHL, while sending Joseph Blandisi and Juuso Riikola back down. Johnson is still waiting to make his NHL debut after signing out of the NCAA ranks almost two years ago, but is having an excellent season in the AHL with 40 points in 63 games. Paul Carey has been recalled once again by the Boston Bruins, who also activated David Pastrnak today. Patrice Bergeron did miss practice, but head coach Bruce Cassidy deemed it a maintenance day and told reporters the star center would be just fine. The Anaheim Ducks announced that they’ve recalled defenseman Andy Welinski from San Diego of the AHL. He has been shuttled back and forth between the Ducks and Gulls in recent days based on their injury situation. Welinski has played in 19 games with Anaheim so far this season, playing a little over 14 minutes a night. The NHL has six games scheduled for this Friday night and at least one of them is must-see television for those who are watching the playoff race in the Eastern Conference. The Carolina Hurricanes travel to Columbus to take on the Blue Jackets in a huge matchup that could decide their playoff fates. The Montreal Canadiens find themselves two points behind the Hurricanes and tied with the Blue Jackets for the wild card spots, meaning they have a chance to catch whichever team loses tonight. As teams prepare for the final stretch drive, we’ll be here to keep track of all the minor moves. The Philadelphia Flyers will have Jakub Voracek back in the lineup against the Toronto Maple Leafs tonight, so there was no need to keep Justin Bailey up in the NHL. The young forward has been reassigned to the minor leagues, where he has eight points in 16 games for the Lehigh Valley Phantoms. Last night, the New Jersey Devils recalled Nick Lappin and Eric Tangradi from the minor leagues once again and could have them in the lineup for tonight’s game against the Vancouver Canucks. The Devils have been decimated lately with injury, and are just playing out the string with no hope of making the playoffs this season. Landon Bow has been recalled by the Dallas Stars, as the team waits to see how long Ben Bishop will be out with his latest injury. Bishop has been back at his Vezina-caliber level this season, but will need a little more to help the Stars do any damage in the playoffs. The St. Louis Blues have recalled Jordan Kyrou again, his third transaction in the span of a day. The young forward will get a chance to help the Blues down the stretch and into the playoffs after a dominant season at the AHL level. The Edmonton Oilers have recalled Joseph Gambardella from the minor leagues, giving them another forward option as they try to hold onto their playoff hope. Gambardella is among the league leaders in goal scoring in the AHL with 27 in 45 games, but failed to record a point in his four games earlier this season for the Oilers. The San Jose Sharks have sent a pair of forwards to the minor leagues, assigning Lukas Radil and Dylan Gambrell to the San Jose Barracuda. Gambrell knows this game having been bounced up and down all year, but Radil hasn’t spent much time in the AHL this season. The team did include Radil in a paper transaction at the deadline, meaning he is eligible for AHL playoffs if the team chooses to keep him down. The New Jersey Devils have re-signed Nick Lappin to a one-year two-way contract worth $700K at the NHL level. Lappin was eligible for arbitration this summer but decided not to file prior to the deadline. Instead, he’ll be back on a deal that gives him a nice $250K guarantee and will try to force his way back onto the NHL club. Lappin, 25, didn’t qualify for Group VI unrestricted free agency this year because he’s only had two seasons under a professional contract. That will change next summer if he doesn’t play in 31 games for the Devils, something that isn’t by any means guaranteed at this point. Suiting up for just six contests in 2017-18 thanks to a deeper and more productive Devils lineup, Lappin instead played nearly the entire year with the Binghamton Devils where he was a dominant offensive performer. Leading the AHL team with 31 goals in 65 games, the former Brown University standout was among the league leaders as well, trailing Valentin Zykov by just two goals for the overall title. He’ll try to bring that same level of offensive production to Binghamton again this season, and drag the team back to the playoffs for the first time since 2013-14 when they were still the minor league affiliate of the Ottawa Senators. Lappin will also represent solid depth for New Jersey, though he doesn’t quite fit into a bottom-six role making it difficult for him to really carve out a spot with the team. Free agency is now less than a month away from opening up and there are quite a few prominent players set to hit the open market while many teams have key restricted free agents to re-sign. Here is a breakdown of New Jersey’s free agent situation. Key Restricted Free Agents: D Steven Santini – The New Jersey Devils went out and acquired Sami Vatanen this season to help a defensive unit that was struggling to keep up with their forward group. While Taylor Hall was putting up an MVP season and Nico Hischier was proving why he was selected first overall, the team didn’t believe they had enough depth on defense and sacrificed Adam Henrique to improve. This summer, further improvement could come from within. Santini, 23, ended up playing 36 games for the Devils in 2017-18, and amazingly logged more than 20 minutes in those games. Though his possession numbers were atrocious, that can largely (but not completely) be explained by the incredibly poor zone starts he was given. More than 72% of the faceoffs taken while Santini was on the ice were in the defensive zone, one of the most heavily-skewed numbers in the entire NHL. The New Jersey coaching staff heavily sheltered Will Butcher this season to allow him to use his offensive talents, a trade that came at the expense of Santini who is considered more defensively responsible. Now he’ll head into RFA negotiations as a possible full-time option on the blue line going forward, especially if the team lets John Moore walk in free agency. He’s not arbitration eligible, and will likely come to an agreement fairly quickly. 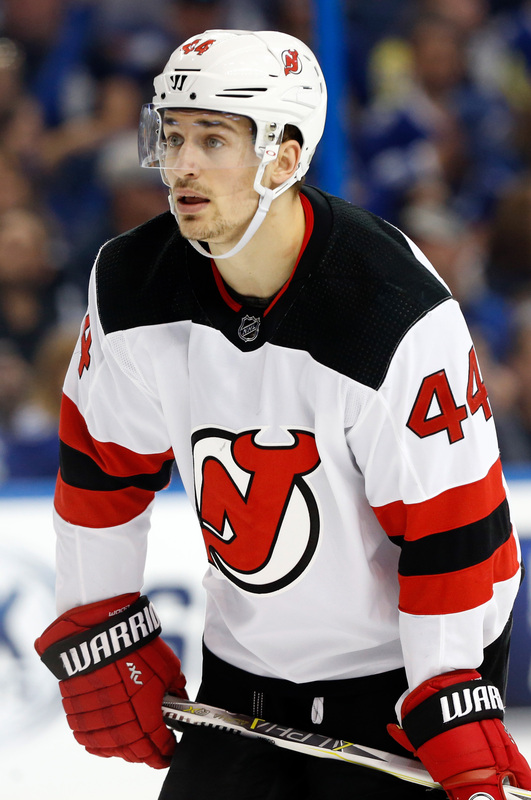 F Miles Wood – Part of the Devils incredible turnaround falls at the feet of Hall and Hischier, but it was the team’s depth up front that had everyone talking. After being a fairly weak offensive team over the last few years they started to come in waves of speed, headlined by Wood’s impressive season. The 22-year old scored 19 goals and was a very effective player for the team at even strength. If he’s given more powerplay opportunities in the future that number could potentially grow even higher, as it wasn’t the result of an outrageous shooting percentage or any other easy to spot outlier. Key Unrestricted Free Agent: F Michael Grabner – After putting up such a good first half the Devils went out at the trade deadline and acquired some more depth players up front, and even spent a second-round pick (and prospect) on Grabner. That didn’t seem to pay off for the team, as the counter-punch artist added just two goals and five points in 21 games down the stretch for New Jersey before going scoreless in just two playoff contests. Still, Grabner is coming off back-to-back 27-goal seasons and will be a sought after commodity on the free agent market. The 30-year old speedster is an excellent penalty killer and can stretch defenses better than almost anyone in the league. Though he can struggle at times to finish his chances, and doesn’t create many opportunities for his linemates, many teams would be lucky to have him suit up in their bottom-six. Grabner is coming off just a two-year $3.3MM contract and will likely be looking for a big raise on a multi-year contract. The Devils may believe that’s too rich for them as they instead look to their young players for continued development. F Patrick Maroon – The other deadline addition for New Jersey was Maroon, who was also coming off a 27-goal season in 2016-17. This year he had just 17, but found his playmaking stride for the Devils and recorded 13 points in 17 games. Struggling with the rest of the team in their first-round playoff exit, he still could represent a perfect fit for the Devils who don’t have many other players in the power forward mold. Maroon is an excellent puck protector, and has shown that when given the chance to play with skilled players is quick enough to still keep up. It’s hard to gauge Maroon’s market after he struggled with the Edmonton Oilers early on. He fetched them just a 2019 third round pick and the rights to college forward J.D. Dudek at the deadline, and may not have a ton of teams knocking down his door in the summer. That would be just fine with the Devils if they’re looking to bring him back, though nothing has been reported between the two so far. Projected Cap Space: Last season the Devils were seen as a dark horse candidate for nearly every free agent because of their huge amount of cap space and this year should be no different. With nearly $25MM in cap room depending on where the upper limit lands, the team could go after any player they want, including John Tavares or John Carlson. Though there are some restricted free agents to get under contract, GM Ray Shero should have just about all the resources he should need to help the Devils make it back to the playoffs once again. The New Jersey Devils have recalled their “Black Aces”, several players who will skate with the team throughout the playoffs but are not expected to play. Christoph Bertschy, Nick Lappin, Michael McLeod, Blake Pietila, Kevin Rooney, Michael Kapla and Brian Strait are all on their way up from Binghamton. The AHL squad did not qualify for the playoffs, meaning the season is over for the rest of the team’s prospects. For McLeod, the 12th-overall pick from 2016, it’s been a disappointing. After dealing with injury to start the year, he returned to the Mississauga Steelheads and didn’t take the expected step forward to become one of the most dangerous players in the league. Though his game has always been built on using his speed to play a solid two-way game, scoring 100 points in 77 games during the 2016-17 season showed off exactly how much offense he could create. In 44 games this year he recorded just 54 points, and Mississauga was knocked out in the first round of the OHL playoffs. Hopefully a taste of the NHL playoffs will be able to spark another level in his development, and he’ll be battling for an NHL spot out of camp in the fall. Otherwise, he’s headed for the AHL to hone his skills and try to be the next young star to help widen New Jersey’s newfound window of contention. After a busy night in the NHL, the league has just three games on tap for today. Instead, teams might use their time off to cement their status for the trade deadline and make inquiries around the league. All the minor moves we’ll keep track of right here. Refresh the page throughout the day to make sure you stay up to date on all the comings and goings. Tucker Poolman has been sent back to the minor leagues by the Winnipeg Jets, after being scratched again last night. It’s been eight straight games in the press box for Poolman, who will get a chance to play again with the Manitoba Moose. In addition to claiming and assigning Gabriel Dumont, the Tampa Bay Lightning have sent Matthew Peca to the Syracuse Crunch. Peca has scored five points in 10 games for the Lightning, and is scheduled to become a Group VI free agent this summer. After being acquired yesterday, the San Jose Sharks have recalled Eric Fehr from the minor leagues, sending Rudolfs Balcers back down in his place. Fehr could get into the lineup as a fourth-line player in the coming days, after an impressive performance for the San Diego Gulls through the first part of the season. The Anaheim Ducks have recalled Reto Berra under emergency conditions while John Gibson deals with his latest injury. Ryan Miller will start for now, and will need him to help them towards the playoffs like Jonathan Bernier did a year ago. Speaking of goaltenders, the Edmonton Oilers have returned Laurent Brossoit to the minor leagues as Al Montoya is set to get back on the bench. Montoya needs to play just three more games for the Oilers to force them into sending a fourth-round pick to Montreal instead of a fifth. Ryan Sproul is on his way back to the minor leagues after getting into four games with the club. Sproul has a point in each of his last two games, but will need to wait for his next chance to get into the lineup. The New Jersey Devils have returned Nick Lappin to the AHL as several players approach a return to the ice. Lappin has played in just six games with New Jersey this season, but is leading the Binghamton Devils in goals with 17. After Carey Price took a shot to the head last night, the Montreal Canadiens have recalled Charlie Lindgren under emergency conditions. With him comes Noah Juulsen under a regular recall, ready to make his NHL debut after battling injury this season. Juulsen was called “very close” to NHL ready in September by his GM, before breaking his foot in training camp. The New Jersey Devils have reassigned Nick Lappin to the AHL’s Binghamton Devils in a move that likely means more than its face value. Lappin played in two games with New Jersey on this most recent recall – his first two NHL games of the season – and looked impressive in both outings. Lappin was involved in the offense, even contributing a goal in last night’s win over the Dallas Stars, and played well in an energy role. The former Brown Bear has also been on fire in the AHL, with 12 goals in 23 games. His demotion, if not for performance, must be an indication that the Devils are adding another healthy body to the lineup. With Taylor Hall, Kyle Palmieri, and Marcus Johansson all banged up, the loss of Lappin is likely good news that one or more of that talented trio is ready to return. The Dallas Stars announced they have sent forward Jason Dickinson to the Texas Stars of the AHL today. He was called up on Dec. 10 and has played a total of five games this season for the Stars with all the injuries the team has dealt with recently. Dickinson hasn’t scored any points, but has been praised for his enthusiastic play for the Stars. He has 13 goals in 20 AHL games, and is a great depth guy when Dallas needs him. The team has recently gotten back both Martin Hanzal and Antoine Roussel from injury, so the need for the 22-year-old has waned. The Minnesota Wild announced after their game today against the Edmonton Oilers that they have assigned defenseman Ryan Murphy to the Iowa Wild of the AHL. Despite playing well, the move is most likely due to the fact that the team intends to activate defenseman Jared Spurgeon, who has been out for the past nine games with a groin injury. Murphy, a first-round pick in 2011, is expected to get more minutes while in Iowa. He has had one goal and one assist in nine games so far this year. We got criticized for giving up on a great young prospect but we had to. That contract was strangling us, cap-wise. When we traded him, our scouts were furious. I’m not going to lie. But we had to do something and that was trade Lawson. Crouse has just 11 points this season for the Coyotes, but he’s gaining valuable experience as a teenager and still has a bright future ahead of him. Meanwhile the Panthers have already essentially used that cap space, as extensions for Aaron Ekblad, Vincent Trocheck, Jonathan Huberdeau and Derek MacKenzie kick in next year. The New Jersey Devils have assigned Nick Lappin to the AHL today, after their loss last night to the Toronto Maple Leafs. The team is headed home for the next three games, as they continue to battle for position in the draft lottery. The team now sits 28th in the league, meaning they’ll have a solid shot at a top-5 pick in the draft this year. Montreal has signed Jeremiah Addison to a three-year, entry-level contract. The Windsor Spitfires forward is still in the OHL playoffs and will be playing at the Memorial Cup this year regardless of the outcome. Windsor hosts the tournament, and therefor gets an entry even without winning the OHL championship. The Buffalo Sabres will lose Rasmus Ristolainen for three games following his suspension, but as John Vogl of the Buffalo News writes, won’t actually be shorthanded in their next game. That’s because Kyle Okposo, William Carrier and Dmitry Kulikov are all ready to enter the lineup after being held out with various injuries. The Sabres take on the Toronto Maple Leafs on Saturday night. Ahead of tonight’s road match-up with the Boston Bruins, the New Jersey Devils have recalled rookie winger Nick Lappin on an emergency basis from the AHL’s Albany Devils. Lappin is expected to get the call tonight, as the 24-year-old forward has worked his way back into the lineup. Lappin has four goals and three assists in 35 games with New Jersey this season, but was sent down to the minors on January 12th and had yet to return to the lineup. While in Albany, Lappin was nearly a point-per-game player, with nine goals and eleven assists in 24 contests. Lappin is in just his second pro season since leaving Brown University, and no matter how many games he plays for the Devils down the stretch, he will not be eligible for exposure in the Expansion Draft. GM Ray Shero will have to look elsewhere on the roster for the solution to his coverage problem. A pair of deadline day acquisitions will make their debuts tonight. With Andy Greene out of the lineup for personal reasons, Dalton Prout will get a chance to show the Devils what he brings to the table. The 26-year-old tough guy had only played in 15 games for the Columbus Blue Jackets this season before being traded for Kyle Quincey at the deadline, but brings a physical game and hard-nosed presence to any game that he is a part of. With another year left on his contract, Prout is looking to impress his new team and carve out a role for himself in the future. In the short-term, he is likely trying to play well enough tonight to get into the Devils’ lineup tomorrow, against his former Blue Jackets team. On the other side of the ice, Drew Stafford will get into his first game with the Bruins since being acquired on Wednesday. It has been a tough season for Stafford with the Winnipeg Jets, as injuries have limited him to just 40 games, and he has managed to score just 13 points in that sample size. However, Boston knows all too well how dangerous Stafford can be when he’s on his game. As a member of the Buffalo Sabres, Stafford was a consistent goal-scoring threat and tended to have some of his best games against the Bruins. Coach Bruce Cassidy hopes that Stafford can get back to his productive ways skating on a line with Ryan Spooner and Frank Vatrano, who have both been on fire since the coaching change. With the trade deadline over with, Vegas Golden Knights GM George McPhee is out scouting with a clearer picture of who might be available to his team on June 21st when the new expansion team will be picked. Tonight, he’ll be taking in the Devils vs. Bruins in Boston, likely with an eye on defenseman. Although Boston and New Jersey are not exactly known for their blue line depth, neither team looks to have many attractive options up front to be exposed in the Expansion Draft. Instead, the Devils will have to pick four of Greene, Prout, Damon Severson, John Moore, Ben Lovejoy, and Jon Merrill to expose, while the Bruins can only protect one of Adam McQuaid, Colin Miller, and Kevan Miller to go along with Zdeno Chara and Torey Krug.